Bubble tea is a popular drink invented in Taiwan in the 1980s. Called zhen zhu nai cha in Mandarin—which literally translates to pearl milk tea—the beverage gets its name from the chewy tapioca, or bubbles (boba if you're from the West Coast), that get mixed in. If you love going out for bubble tea, you can use this easy recipe to make a batch of your own at home. It'll not only save you money, but going the DIY route will also allow you to flavor the tea to your liking. A classic version calls for black tea, milk, syrup, and tapioca, but you can reduce the amount of sugar or use soy or almond milk in place of regular dairy. Note: while there are multiple steps to this recipe, this bubble tea is broken down into workable categories to help you better plan for preparation and cooking. In a saucepan, bring the water to a boil and add the sugars. Reduce the heat and simmer until the sugar crystals are dissolved. Remove from heat. Boil the water in a large pot. Add the pearls and boil for 30 minutes. Stir occasionally to make sure the pearls are not sticking to each other or to the pot. Turn off the heat and let the pearls steep in the water for another 30 minutes with the lid on. Drain the tapioca pearls and rinse with cold water to cool them down. Place them in the sugar syrup. Make sure that the pearls are covered and stir the pearls well. Place 3 ounces of tapioca pearls in a large glass. In a cocktail shaker, combine the tea, milk, and ice cubes. Shake well. Pour the shaken mixture into the glass over the tapioca pearls. Tapioca pearls are the key ingredient in bubble tea. The pearls are small balls of tapioca starch that develop a wonderfully gummy and chewy texture when cooked. The balls expand considerably during the boiling process, so make sure you use a large pot. As a general rule, the more pearls cooked, the more water should be used. Feel free to experiment with the ratio of white sugar to brown sugar and the ratio of the sugar to water. 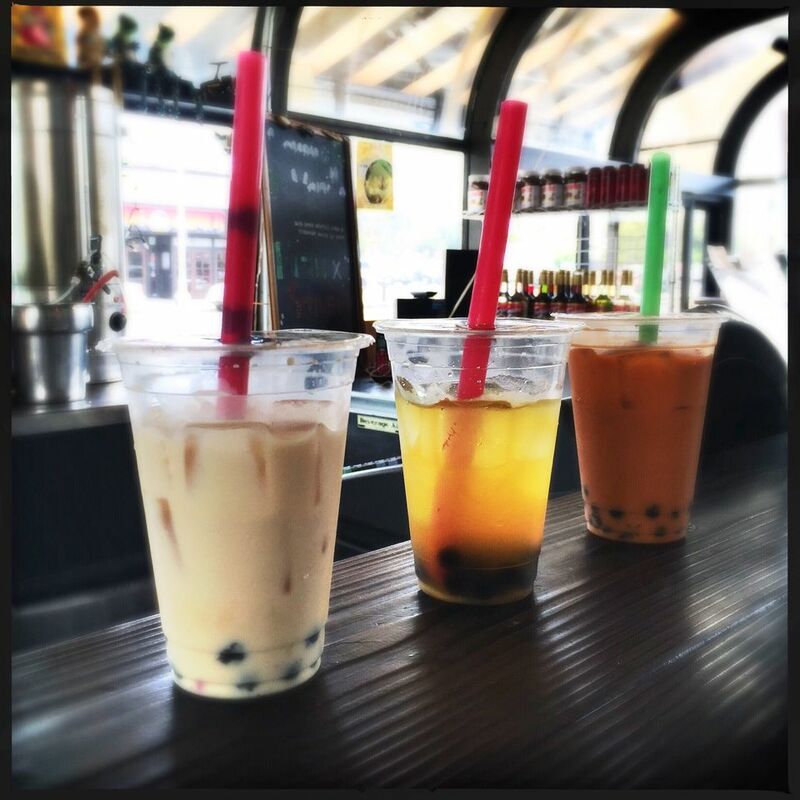 Popular alternatives for black milk tea that are often offered in bubble tea shops include green tea sweetened with honey or fruit syrups, but you can substitute with any variety of tea. Other potential add-ins include pudding, nata de coco, and aloe.